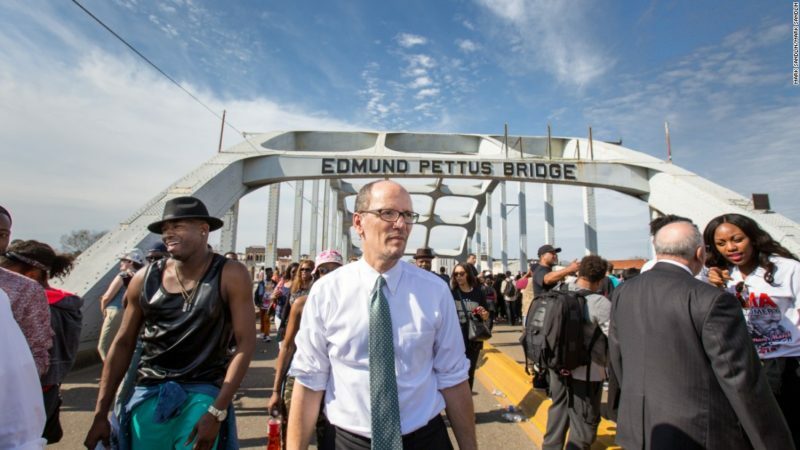 Tom Perez on Edmund Pettus Bridge on the 50th Anniversary of the "Bloody Sunday" March from Selma to Montgomery (CNN). In June, Payday Report exposed that DNC Chair Tom Perez had stumbled in his pledge to provide paid internships at the Democratic National Committee. Now, after much public outrage following Payday’s investigation, we have learned that the DNC intends to implement a paid internship program starting in January 2018. When running for chairman of the Democratic National Committee, Tom Perez pledged on multiple occasions to pay all interns at the DNC. However, Payday exposed that as late as June 2017, the DNC was still advertising for unpaid interns well into the fall semester. Following much public outrage after the publication of Payday’s story, the group Pay Our Interns met with Tom Perez and was able to secure a pledge from Perez to pay the DNC’s interns. Pay Our Interns campaign founder Carlos Vera credited the work of Payday Report in helping get the DNC to the table to strike a deal on paying its interns. “[Payday] brought the spotlight on this and if it wasn’t for that, it would have been a lot tougher,” said Vera. Beginning in January 2018, the DNC will implement a program to pay some—but not all—of its interns a stipend of $3,000 per semester term. While the DNC still won’t be paying all of its interns, Carlos Vera applauded the move. Now that the DNC has agreed to pay its interns, Vera’s organization hopes to pressure the Democratic Congressional Campaign Committee, the Democratic Senatorial Campaign Committee, and other committees to pay their interns. Vera said that if Democrats really want to examine why they have lost elections, they should first look at the people they hired to run those campaigns. Vera said that Democrats lag behind Republicans in providing paid internships. The RNC already had in place the Eisenhower Intern Program. According to Vera’s group Pay Our Interns, which tracks which congressional offices pay their interns, 50% of Republican Senators pay their interns, while only 31% of Democratic Senators pay theirs. The decision on whether or not Senators pay their interns has nothing to do with which political party is in power since congressional offices have equal operational budgets. Vera said it is more of a question of priorities. “I feel like the difference is that Democrats say that you are getting paid by making the world a better place while Republicans are under no illusions and feel that if you work you should get paid for it,” said Vera. Donate to Payday to help us continue doing hard-hitting reporting that has impact. Be the first to comment on "IMPACT: Following Payday Expose, DNC Begins Program to Pay Its Interns"